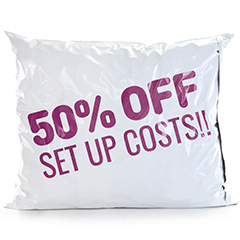 We offer the lowest prices for printed carrier bags anywhere on the web! From as little as 4p a bag! The Polybags approach - keep it simple, fast & cheap! Printed carrier bags are the perfect way to advertise your business. Get your company design or logo printed on our quality carriers and stand out from the crowd as your customers do your advertising for you. 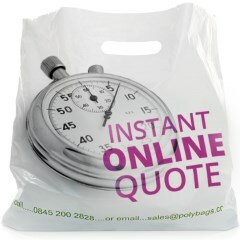 Polybags can provide a real-time instant quote on your printed carrier bag order, 24 hours a day, seven days a week - the only manufacturers to do so. Get your quote in less than 60 seconds! We keep our service simple and fast to ensure our prices stay low while the quality of our bags remains extremely high. Why complicate the process? We focus on patch handle carriers - a classic bag with a reinforced handle to provide extra strength - and offer this in five popular sizes - mini, small, standard, premium and large. All of our bags are 55 microns thick (220 gauge) - a thicker, stronger, higher quality polythene that provides a smoother, silkier and more glossy bag. Choose from clear, white or coloured polythene, up to four different ink colours and print the same or a different design on both sides of the bag at no extra cost. Our printed carrier bag prices are the lowest online, starting from as little as 4p a bag. We specialise in both long and short batch runs, with a minimum order of just 1,000 bags in many cases - a great option for advertising your key message at events and conferences or for short term promotions. If you want an even faster option, we also provide the widest variety of ready-made clear and coloured stocked carrier bags available off the shelf at fantastic wholesale prices. The classic shopping bag for high street stores, patch handle carriers are made from thicker polythene and have a reinforced patch handle to provide extra bag strength and a more solid feel. Available in white or clear polythene, this is the shopping bag that never goes out of fashion! NB: We supply patch handle carriers printed with your design or logo, available in batches of 1,000 or more. Our printed carrier service is fast, cheap and simple. Get yourself an instant quote, 24 hours a day, seven days a week! The vest carrier is the most commonly used carrier bag in the UK. 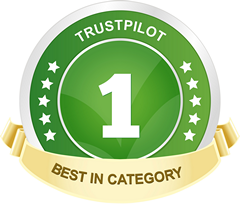 Popular with supermarkets, grocery stores and market traders everywhere, this is the economy carrier that gets the job done. Vest carriers are made from high density polythene (HDPE), a strong substance that allows the bag to be produced thinner - just 8-28 microns thick - thus saving costs. These crinkly carriers are available from as little as 1p a bag, offering great value for money. Available in white, blue and candy stripe colours and in a range of thicknesses and styles to your budget. These Classic Coloured Carrier Bags are made from polythene that varies in thickness (gauge). The polythene at the top of the bag is twice as thick as at the bottom to provide extra strength around the all-important handle area. They also come with a 3" bottom gusset to provide extra room for bulky items. This extra space, combined with the strength of the bag, makes the varigauge carrier a very popular shopping bag. Polybags stocks a full spectrum of colourful varigauge carriers in a range of sizes, so we should have the perfect bag for you, to help your customers really stand out from the crowd. These eco-friendly carriers mean you can look out for the environment while still getting the job done. 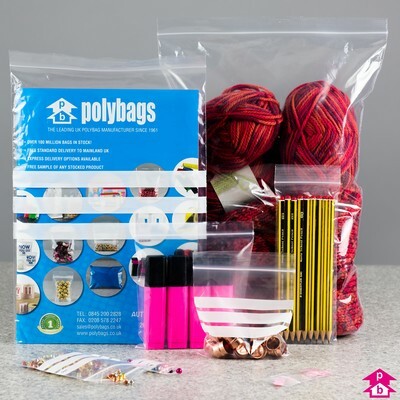 Polybags stocks a variety of biodegradable carriers that provide all the quality and strength that you need in a carrier bag, but being made out of biodegradable materials such as potato starch - yes, carrier bags made out of potatoes! - they are also 100% renewable and sustainable, as they completely break down in regular composting conditions, thus reducing the impact on the environment. These premier quality carrier bags are made from thick (250-300 gauge) clear polythene and feature an integral white clip that allows you to fasten the two sides of the bag together, which keeps the contents of the bag secure and stable. The clear polythene provides a fantastic way for retailers to display their products, whilst the clip close handle allows you to hang the bag up to give it extra prominence. Get that extra quality and touch of class with a clip close carrier. Flexiloop carrier bags are placed towards the luxury end of the carrier bag market, costing 2-3 times the price of traditional patch handle carriers. Made from a thicker polythene than most carrier bags - usually 60-90 microns thick - flexiloop carriers get their name from the loop handle heat-welded to the inside of both sides of the bag. These bags also regularly feature bottom and/or side gussets. Flexiloop carriers are often sold by supermarkets as reusable 'bags for life', while the flexiloop style is also used on large paper bags - a popular choice amongst top end high street retailers and boutique stores. Grip seal carriers are no ordinary carrier bag - they are a revolutionary hybrid between the traditional carrier bag and the grip seal bag, also known as the minigrip bag. Grip seal carriers are held via a cut-out handle in the same way as a regular carrier but - and here's the twist! - they can be sealed shut via an integral grip seal running across the width of the bag, just below the handle. This seal can be squeezed shut and opened time and again for continual re-use. The grip seal carrier bag may be a lesser-spotted carrier, but it provides retailers with a fantastic way to show off their products. Another clever hybrid product, mailing bags with handles are a cross between a mailing bag and a carrier bag. Featuring an integral double adhesive strip seal at their entrance - the opposite end to the handle - these bags allow you to seal them and use as a compact, secure carrier bag on two occasions. They can also be used to as a mailing bag to send items via regular post or courier. Their double seal allows for easy returns, making them popular with online retailers and mail order companies. Paper carrier bags offer a useful alternative to polythene carrier bags. Paper carriers are designed in the same style as the flexiloop polythene carrier with an external handle - fitted to the outside of the bag in this case - allowing for easy pick up. Available in a range of sizes, these bags fold up flat but open out to produce a convenient bag with a square bottom that means it can sit flat on any surface. Paper carriers are available in plain brown or white - both popular with take aways and restaurants delivering food - or in a range of colours, popular with retail outlets. Polythene drawstring and duffle bags open and close using a string threaded around the opening to the bag, similar to netting bags. Drawstring bags are made from 200 gauge (50 micron) clear polythene as standard and are used for storing or displaying a range of items, including food. They feature two strings which, when pulled in opposite directions, close the bag. Duffle bags tend to be larger and feature a single thick cord with both ends attached at the foot of the bag. They can carry more substantial contents than drawstring bags, making them a popular choice among sports and shoe retailers and as a kit bag for swimmers and sportspeople. However, drawstring and duffle bags can cost up to 40-50 times the price of traditional patch handle carriers.